Our Premier Grades and ViQueens returned to play over the weekend, taking on Royals and Gungahlin respectively. The rivalry continued for Vikings and Royals, both teams involved in some heated contests across the Grades. The stage was set for all Grades to play some thrilling rugby, the clear skies and warm weather drawing in the crowds and allowing for some free flowing rugby. With 3rd and 4th Grade taking a well earned rest, our ViQueens kicked off proceedings at 10:55am, playing on Field 1. The girls showed their intent early, shifting the ball and playing some excellent Rugby. What was most pleasing for the ViQueens was their ability to build off each phase, constructing smart plays that allowed them to gain the advantage line and cross the line time and time again. Regan Hart had an absolute blinder in her first game of Rugby, using some blistering pace to break the line and set up play for those that could keep up with her. Tayla Stanford provided the punch, making solid inroads with her dominant carries and offloads. It was an all-round performance by our girls, who finished convincing winners, 52-0. After a quiet performance against Wests in their last outing, the Colties were primed to put in a solid stanza against old rival Royals. The Vikings were quick to make an impression, crossing for several 1st Half tries and playing some champagne rugby. The Colts forward pack was on point – led by destructive prop John Madjaga, each of their carries made it over the advantage line and then some, giving the backline who were well controlled by centre pairing Billy Carberry and Sam Conti plenty of room to move. What was most impressive was their defence – the Royals attack were kept in their own half for the majority of the game, the Vikings only conceding a try in the final minutes of the match to put Royals on the board. The Colts played their best game of the year, taking the victory 48-5. The Dirty Twos were ready to continue the dominance set by the Colts in what was looming as another bruising encounter. Royals got off to a hot start, peppering the Vikings defence and making the most of their opportunities. The 1st Half was tight, the Vikings facing a tough contest heading into half time, Royals generally showing more enthusiasm. Another rev up from Coach McNicol ensured 2nd Grade would flip momentum their way, playing a much improved 2nd Half. Isaiah Tikitau continues to impress in the backrow, playing well above his age. The halves pairing of Lua Vailoaloa and Jack Howard was dynamic, both players directing play superbly. The Vikings closed out the game with a spectacular try in the corner, Nic Murray racing away and then jumping over two defenders to touch down in NRL-esque fashion. Vikings 44-22. When 1st Grade took on Royals in Round 1 the match ended in a nail bitter, Royals taking the victory 32-31 after a late comeback by the Vikings. 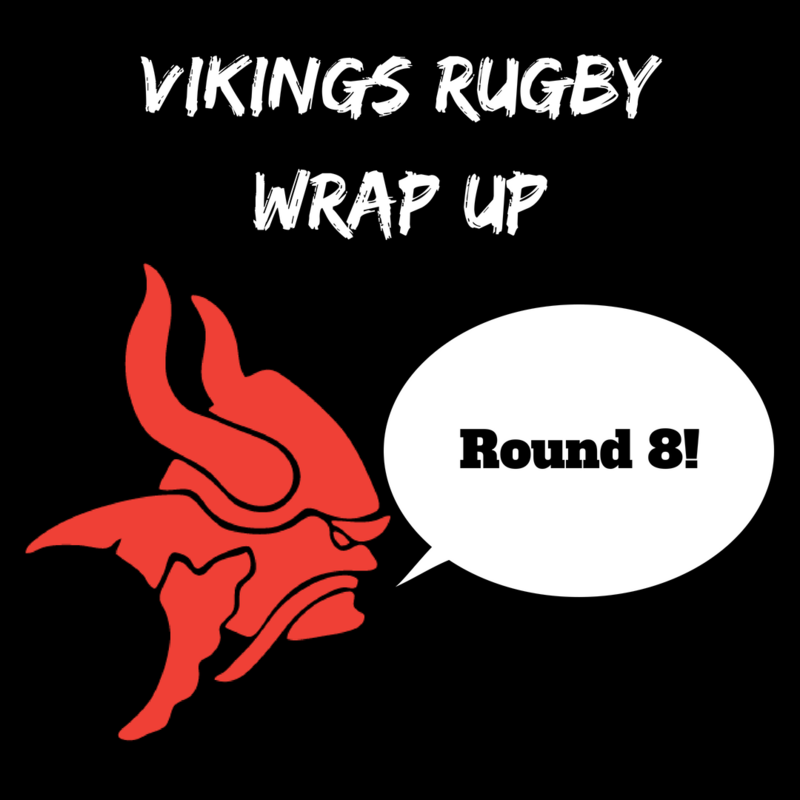 Chasing redemption, the Vikings came out of the change rooms fizzing. A moving Welcome to Country was conducted by Paul House pre-match to recognise Reconciliation Day. Thanks to Paul for joining us at Viking Park. Following proceedings, the match kicked off in ideal conditions but the game proved to be an arm wrestle early. No 8 Angus Allen left the field after 5 minutes with a shoulder injury, throwing Jayme Field into the cauldron after a huge shift in 2nd Grade. Jayme went on to have an outstanding game, hitting hard in defence and making himself useful across the park. The majority of the 1st Half was played between boths team’s 22m line, neither Royals or Vikings able to gain momentum and break the other’s defence. The Vikings scored a try on the stroke of half time to head into the break 10-14 down. The chat from Coach Scrivener was to continue to build pressure, play fast and win the mental game. Both teams refused to let up on one and other, putting on a spectacle for all in attendance. Angus Wagner was the best on the paddock, dominating the set piece and the breakdown in a man of the match performance. Max Ravouvou relished his opportunity back in 1st Grade, playing well above his weight in an impressive game on the wing. 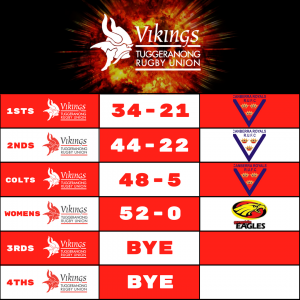 The Vikings proved their resilience in the last 10 minutes of the half – down on the scoreboard, the boys rallied off the back of a welcome return from Isaac Thompson to score three unanswered tries and win the contest 34-21. A big congratulations to Angus Wagner, who was awarded the Vodafone Man of the Match for his performance! Thanks to Royals and Gungahlin for another great day of Rugby. Next weekend our Premier Grades take on Queanbeyan out at Campese Oval, while the ViQueens are out at Dowsett Oval against ADFA and 3rd Grade are in Young. Don’t miss any of the action as the Vikings look to continue their dominance!